Gallbladder Stones (Gallstones) are stones or lumps that develop in the gallbladder or bile duct when certain substances harden. If they block the bile duct, they can be extremely painful. “Cholelithiasis” is defined as the presence of stones in the gallbladder. The majority of gallstones are composed of cholesterol (96%) in the form of layers, calcium salts (3%), and bilirubin (1%). Gallstones are thought to be caused by an imbalance in the chemical make-up of bile inside the gallbladder. Bile is a liquid produced by the liver to aid digestion. Experts are not completely sure why some people develop the chemical imbalance in their gallbladder that causes gallstones. It is still unclear exactly what leads to this imbalance. Sometimes only one stone will form, but there are often several at the same time. Gallstone disease is primarily a metabolic disease. We do know that gallstones are more common among overweight/obese people, especially women. Obese children have a considerably higher risk of developing gallstones, compared with kids of healthy weight. 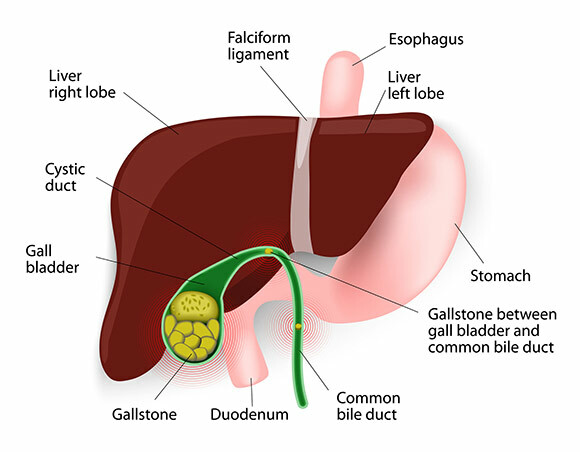 The common bile duct lithiasis begins by a migration of small gallstones in the gallbladder (where they originated) to the common bile duct , where they continue to grow. (80%) of gallstones do not cause symptoms . If symptoms occur, the most common symptom is pain in the upper right quadrant of the abdomen, which worsens after meals. Other symptoms include gas, indigestion (bloating), nausea and vomiting. In severe cases, there may be fever. Any type of cocoa is not tolerated by any patient. Milk and dairy products should be skimmed/low fat. There are not enough low-fat cheeses, hence their consumption is not recommended. Low-fat cooked ham exists, but you must wait for the symptoms to disappear before consuming it. White fish (1-2% fat) is tolerable. Blue fish or fatty fish (10-12% fat) is strongly discouraged. Shellfish is low in fat (a maximum of 5% fat), yet it is discouraged. Eggs (6% fat): Fat is only in the yolk and its consumption is strongly discouraged because it produces a continuous contraction of the gallbladder. Crude oil is much better tolerated than frying oil. You must distribute the intake of crude oil throughout the day. Vegetable margarines are tolerated better than butter, but are not recommended. All visible animal fat should be eliminated. Fatty nuts (50% fat) are discouraged. When you have been free of symptoms for a few weeks, you can have a food or use a cooking method you were used to before the problem and that you miss. It may be tolerated, but it must be done gradually and cautiously. Puddings made with skim milk: you must be sure of its origin before ingesting. Start liquids intake 24 hours after surgery. If tolerated, after 48 hours start semi-liquid, low fat biliary diet (½ portion). After 72 hours, soft biliary diet (½ portion). Continued diet: soft biliary diet. If tolerance has been good, continue with an easily digestible diet in moderate amounts. Continue the biliary diet for 6-9 months. Cholecystectomy (not simple) refers to when, in addition to removing the gallbladder, the common bile duct is also opened on suspicions of finding stones in it. The sphincter of Oddi is also opened to keep it always open. A slower progression diet should be followed in the case of simple cholecystectomy. Therapeutic diets should be personal and depend on your medical condition and specific food culture. The specification of food (specific menus) right for you may not be right for someone else and therefore the information we provide is generic. Please note that this information is not intended to replace any treatment or to induce self-prescription. Always ask your doctor or specialist who knows the status of your health best, and must prescribe the diet right for you.